The Arjun MBT Mk II is an improved version of Mk I. An additional weight of about 3 tonne for the Arjun Main Battle Tank Mk II has resulted in problems relating to agility, mobility and operational employability. 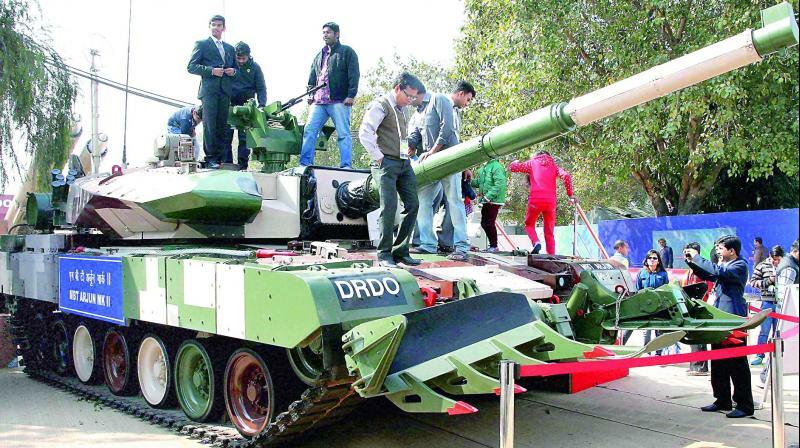 NEW DELHI: The state-of-the-art Arjun Main Battle Tank Mk II is facing a challenging task in trying to shed weight from 68.6 tonne to less than 65 tonne. “So far, by using lighter fitments and making adjustments we have been able to lose only about 1.5 tonne which is far above the Army’s requirement of less than 65 tonne tank. Redesigning and assessments are on,” said a military source familiar with the weight loss effort who did not want to be named. The Arjun MBT Mk II is an improved version of Mk I and has been developed with 73 tank-fittable improvements of which 15 are major tank-fittable improvements as a result of which an additional tonnage was gained over the Arjun MBT Mk I. But additional weight has resulted in problems relating to agility, mobility and operational employability. That is why it is important to reduce the weight of the tank. The weight reduction effort is now being undertaken by the Defence Research and Development Organisation and Combat Vehicles Research and Development Establishment mainly by “redesigning the hull and turret structure by using innovative material to replace the conventional structure”. The Army had ruled out an agility and mobility test of Arjun tank that was to be pitted against the Russian-made T-90 saying that the Arjun MBT Mk II and T-90 are of different class and weight classifications and their deployment is as per assigned operational roles.